Obituary – Kite, Ambrose Seth « Perry High School Alumni Association, Inc.
Ambrose “Seth” Kite was born in Perry November 17, 1898, and died in the base hospital at Limoges, France, on September 16, 1918, at the age of 19 years, 9 months and 29 days. Seth was raised among us and attended the city schools. 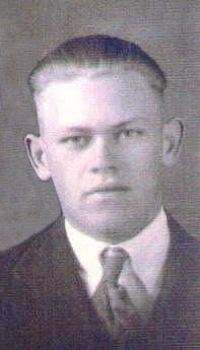 His last year in high school, 1917-1918, he was prominent in football and other athletics. The first news of his death was received by his mother, Mrs. Maggie Kite-Dix, on October 18th, 1918, in a letter from Captain B. Brown in which the circumstances of the accident were related. The battery was in billets and Private Kite was sleeping in a hay loft reached by a ladder. He got up about 4:00 a.m. on September 15th, to go outside. It was dark and he apparently only half awake. In descending the ladder he stumbled and fell a distance of about eight feet, striking his head on the stone floor, fracturing his skull and rendering him unconscious. His comrades rushed to his assistance and took him to the Camp Infirmary at once, where emergency treatment was given him. He was later removed to the Base Hospital at Limoges, and died the next morning without regaining consciousness. His body arrived Tuesday morning, January 11, 1921, and was buried in Grace Hill cemetery Wednesday afternoon. Services were conducted in the Methodist church by the American Legion, Rev. David Thomas, officiating. Beautiful floral offerings covered the casket, arranged about a center piece of a solid bed of white narcissus with a golden star of small chrysanthemums, the tribute of Ellis-Jirous Post to their fallen comrade. One of the largest crowds ever gathered to pay tribute to one departed from us gathered at the church and followed to the cemetery. An honor guard of a soldier, a sailor and a marine, led the procession. The Third Regiment Band preceded the hearse, with four over-seas veterans and two sailors as pall bearers. Over 100 ex-service men, headed by a firing squad followed. Short services were conducted at the grave by Post Commander George Mac. Miller, and Rev. Thomas, who was formerly a Y.M.C.A. secretary. As the casket was lowered a salute was fired, the bugler sounded taps and all that was earthly of a fallen hero was returned to the earth from which it sprang. Besides his mother, Mrs. Maggie Kite-Dix, he is survived by a brother Casper who is in the aviation corps at Dallas, Texas and a sister, Mrs. Paul (Marie) Harding of Perry.